Rather than creating a substitute for a real museum visit, Internet technology has the potential to extend and enrich the total museum experience, particularly in the areas of personal engagement, participation and community involvement. Participatory virtual exhibitions are one way this can be achieved. This paper examines a number of participatory virtual exhibition projects and discusses their different functional models and interfaces. 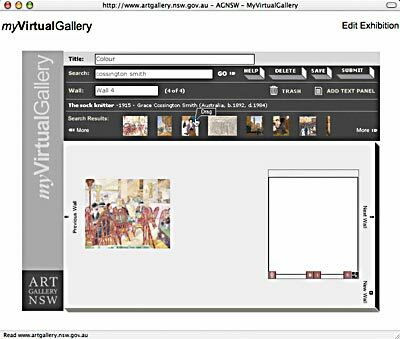 One project, the recently launched myVirtualGallery (Art Gallery of NSW) is examined in detail, including discussion of important and interesting philosophical issues raised during debate amongst museum professional staff shortly before the project’s official launch. When Internet technology was first applied in the context of museums, some people in the field spoke excitedly about how the Web could be used to create on-line virtual museums. No need to go to Paris to visit the Louvre, or New York to visit MOMA: people would be able to visit them from the comfort of their own homes. For a while the goal seemed to be to make the on-line experience resemble as closely as possible the physical experience, using simulated 3D spaces and VR (Virtual Reality) technology. While it is clear that no representation on a computer screen, no matter how high the resolution, could ever substitute for an encounter with a real object, physical museums also have certain built-in limitations. Let us examine, side-by-side, some characteristics of the typical experiences of visiting a physical museum on the one hand, and a museum Web site collection area (or on-line museum) on the other. Although some of these observations are based on an art museum context, most will apply to museums generally. One, perhaps obvious, advantage of the physical museum is that its objects, being physical, can be experienced directly (although perhaps behind glass), unlike objects in an on-line museum, which are representations of physical objects. Another advantage of the physical museum is that visitors can generally arrive without preparation and browse at their own pace. Someone visiting an on-line museum, however, is usually presented with two options: to search (e.g. by artist, title, keyword etc.) or to browse by curatorial area. Thus, visitors are expected to know what to search for, or else to have a grasp of the curatorial hierarchy of the museum (e.g. they might drill down from Australian, to 19th century, and then to Sculpture). A third advantage of the physical museum is that objects are carefully arranged by experts (curators) to appear in the context of other, related objects (generally related by location and/or time). Objects in an on-line museum, however, are actually records in a database and, as such, are normally not pre-arranged at all. On the other hand, the rarity (or uniqueness ) of physical museum objects, clearly one of their significant attractions, restricts each one to being in a single, fixed position at any given time. This, combined with architectural limitations of space, means that for many physical museums, only a small proportion of their objects are ever on public display at any time. This restriction has prompted some museums to create special areas where visitors may ask to view specific objects not on display (e.g. a prints and drawings study room). Many physical museums offer aids to interpretation, such as catalogues, text panels, extended labels, guided tours, lectures, performances and other public programs. On-line museums offer extended information on some objects, but beyond that, visitors are generally expected to do their own exploration using internal and/or external search engines. One final advantage of the physical museum is that it can be a social, as well as a cultural, venue: many people visit in pairs or groups, although a solitary visit can also be rewarding. However, visiting an on-line museum (as with any Web site) is generally a solitary experience only. This comparison is summarised in Table 1. Definite positive and negative characteristics indicated with [+] and [— ] respectively. As we can see, both types of experience have strengths and limitations and are complementary. One limitation of the physical museum experience — that each physical object can be in only one location at a time — is simply a consequence of the laws of physics. Yet two strengths — the ability to enter unprepared and start browsing the collection (i.e. without having to know what to search for) and the presentation of objects in context — are, by convention, assumed to apply to the physical museum experience only. In addition, one characteristic of the physical museum — that objects are selected and arranged by curators — is both a strength and a limitation: a strength, because it makes unprepared browsing possible and because visitors benefit from the expertise of professionals; a limitation, because it severely restricts opportunities for visitors to create their own narratives or make their own personal connections. The reason for this requirement in a physical museum context is clear: it would be an abdication of responsibility for a museum to allow the public continually to handle and relocate its precious and unique objects. However, no such restrictions need apply in an on-line museum. The rest of this paper looks at how Internet technology can be applied to remove such limitations in practice and achieve personal engagement, participation and community involvement for an on-line museum's visitors. A reasonably straightforward way to bring the browsing experience to the Web is with navigable panorama technology such as QuickTime™ VR, in which a series of panoramic images of an exhibition is created and clickable regions inserted for navigation and zooming in on individual objects. While it is theoretically possible to create a navigable panorama of an imaginary exhibition, this technology is generally used as an extension of photo-documentation: to capture a physical exhibition and to partly mimic the experience of visiting it. One partial solution to the problem of achieving personal engagement and visitor participation is to give each visitor some private space to collect illustrated bookmarks of favourite objects, such as offered by the Metropolitan Museum of Art, New York, with its My Met Gallery (http://www.metmuseum.org/Works_of_Art/gallery.asp). The interface is very sparse: below each illustrated object record in the general collection database is a link: Add to My Met Gallery. If you are registered with the Web site (and your computer accepts cookies) you are taken to a page with a thumbnail of your chosen artwork and basic caption details, below any other artworks you may have chosen previously. To modify your selection you have just two options: remove an artwork or add another; there is no facility for rearranging them, or adding personal notes; nor is there any way to share your lists with others (short of sharing your login and password). It has been shown (Muchinsky, 2000) that participation and recognition are strong motivating factors: people usually feel more positively towards an activity if they feel they have contributed something meaningful towards a tangible outcome, and even more so if their contributions are publicly recognised in some way. Thus, if a visitor were given the opportunity not only to select personally meaningful objects from a collection but also to arrange them, write something about that choice and make the annotated arrangement publicly available, it is reasonable to expect the value of that activity for the visitor to be higher than for just making a private selection. This may have been the thinking behind a project of the Fine Arts Museums of San Francisco (FAMSF): Virtual Gallery. 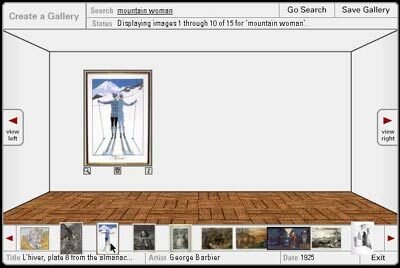 Running from 2001 to 2005, Virtual Gallery allowed any visitor to choose works from the collections and create a small exhibition with a title and optional introductory text. This exhibition then became part of the FAMSF Web site, meaning that others could view it. (Note: The FAMSF Virtual Gallery has now been replaced by My Gallery: http://www.thinker.org/gallery/index.asp). The entry page of Virtual Gallery featured a representation of six rooms, each one containing a link to an exhibition in the form of a thumbnail image. Each exhibition had four walls, with an average of two or three artworks per wall. As you moved your mouse-pointer over an artwork, basic caption details appeared at the bottom of the page. If you clicked on the artwork, a new page (from another part of the FAMSF site) popped up with extra information about it. To find artworks for your own exhibition (see Figure 1), you searched the collection, using keywords (possibly an artist’s name). The results appeared as thumbnails along the bottom of the screen, ten at a time. To choose one, you just dragged it on to a wall. Artworks could be enlarged to their maximum possible size (and reduced again), moved, and deleted. When you clicked SAVE, you were prompted for a title, an (optional) short description and even a list of email addresses of people to invite to your ‘opening’. Yours then displaced the oldest of the six current exhibitions and remained there until, six exhibitions later, it too got pushed off, into a publicly viewable archive. The large number of exhibitions (over two thousand) in the Virtual Gallery archive, or Index testifies to this tool’s popularity and ease of use. However, many appeared hastily assembled. A more likely explanation than a lack of care is that each exhibition had to be completed within a single session; there was no way to save an exhibition-in-progress. I suspect that many visitors would have been initially excited by the possibilities of this tool, would have started creating an exhibition to see how it worked, but then realised that they did not have the time right then to give the task the attention it deserved. (It is perhaps an indictment of the hectic pace of modern life, but knowing that a task requires a certain uninterrupted block of time is an almost certain recipe for indefinite procrastination!) This was exacerbated by the fact that every exhibition, unless abandoned mid-way, went public automatically. This raises another interesting point: If a remarkable exhibition were created, nothing could prevent it from being effectively lost, once it got pushed off the front page, into an alphabetically arranged archive, or ’Index. Briefly, this is how it works (see Fig. 2). Every new exhibition starts with a single wall. You search the collection (using a single search field), choose an artwork and drag it onto the wall, then give the exhibition a title and a short introduction (which can be changed later) and click SAVE; your exhibition is now in the system. You can continue building it — taking as much time as you like — by adding extra walls and artworks. Exhibitions can be submitted to be made public by clicking SUBMIT. This changes the status of the exhibition from ‘under construction’ to ‘pending approval’ (to temporarily prevent further changes) and sends an email to the virtual gallery manager (who may be different from the Web site manager). Approved exhibitions automatically appear on the Exhibitions List page, from the newest to the oldest, and selected exhibitions can also be made to appear in the ‘Featured Exhibitions’ section on the Welcome page. Who has the right to make public statements about objects of public significance, in particular, about artworks? Is there such a thing as a definitive, authoritative interpretation of an object or artwork? Should a museum allow itself (e.g. its acquisition choices) to be publicly criticised, in the same way that newspapers do in their Letters to the Editor? There is probably also a continuing nervousness about the Internet: whereas a physical exhibition has a finite duration and a finite, controllable set of visitors, content on the Web can theoretically remain available indefinitely, to an unseen audience. The pages were moved to the Web site's Education section (it was originally under Collection). Incidentally, it is interesting to consider why this would (partly) appease the authoritists. Perhaps the museum education realm is seen as one where strange and inappropriate things, from a curator's point of view, already happen; so, as long as it is quarantined there, the damage may be minimised! The public response to myVirtualGallery, although initially slow, has been increasing steadily. In the six months between the official launch and the end of December 2005, exactly 250 exhibitions were created by non-staff. Of these, 205 (82%) were never submitted. Of the remaining 45 exhibitions, 28 (62%, or 11% of the total) were submitted but rejected (with comments) — and never resubmitted — and 17 (38%, or 7% of the total) were submitted and eventually approved, mainly with minor modifications (see Fig. 3). From the relatively low number of approved exhibitions it can be seen that the criteria went beyond the mere absence of libelous, offensive and factually incorrect statements. The aim — at least in the early stages — has been to produce a set of public exhibitions that are insightful, informative and thought-provoking. The remaining statistics refer to all exhibitions (under construction and approved), except those created by museum staff. Despite the fact that users are allowed to create exhibitions over a period of time and to make considered responses with text panels, roughly 90% of exhibitions were created and last modified within the one day, and 75% have only a brief introduction but no other text panels. What is clear from this is that just giving people the opportunity to spend more time, attention and effort creating their own virtual exhibitions does not automatically mean that they will take advantage of this opportunity. It appears that most people still create exhibitions in a single session, probably just to see how the application works. However, by also allowing people to decide for themselves whether or not they wish to submit their exhibitions (and, as the figures reveal, most are never submitted), the experience for viewers can be made more rewarding, because they do not have to wade through countless ‘disposable’ exhibitions. There was a concern, before the launch, that the task of processing submitted exhibitions would be too onerous and time-consuming for me. Fortunately, however, this has not been the case so far. I have even managed to write fairly detailed responses to all submissions, explaining my decisions and offering constructive suggestions. However, if the use of myVirtualGallery by schools continues to increase — with more classes submitting batches of exhibitions at a time — I will probably need to involve teachers in the assessment process somehow. In addition to 20 exhibitions about a single artist, there were 22 — by the general public — in which the title of every artwork contained a common word. An additional 50 exhibitions were created by students in the one (year 4/5) class, and used the word Aboriginal, presumably at the direction of their teacher. Searching by title — a less-than-ideal substitute for searching by subject keyword — was necessary, unfortunately, as the collection database contained no keywords field. A commonly observed problem was that of mismatched relative sizes, where an artwork that is quite small in real life was made to look similar in size to a much larger work. Ensuring that all artworks in an exhibition are automatically in proper and accurate scale to each other, while technically possible, would not be desirable in all cases (otherwise, some would have to appear miniscule). Nevertheless, it is important to acknowledge in some way the issue of relative size of physical objects. Perhaps there needs to be an easier way to convey the real scale of an artwork in the creation phase. In order for myVirtualGallery to operate at a reasonable speed over an average Internet connection, it was decided that thumbnail images (specifically, the lowest of three available resolutions for all works illustrated in the collection database, with a maximum dimension of 152 pixels) would be used throughout. It is only when an image is double-clicked that it appears at a higher resolution, in a separate window. However, this means that if artworks are enlarged too far on the wall (something that users seem to do fairly often), they appear blurred and jagged. One solution that is being considered is to use thumbnails for creating exhibitions (thus speeding up searching) but the next higher resolution for viewing them. Of course, this would still have a significant effect on the loading time of exhibitions with many artworks. Although the ability to search for exhibitions by creator/curator, title and introduction is a significant improvement over an alphabetic index of titles, a valuable addition would be the ability to search by artworks. Perhaps a visitor, while viewing an exhibition, could click a button that says View other exhibitions that share artworks with this one. This would take the community networking power of myVirtualGallery to another level. There is one significant way in which the process of creating a myVirtualGallery exhibition has turned out to be inferior to the process of creating a physical one. Currently, searching for artworks creates a shortlist of thumbnail images, one which can be refined by removing unwanted items. However, this shortlist is not saved at the end of a session. A real-life curator will often spend weeks mulling over a list of possible artworks before doing anything else. This is commonly done with photocopies of the artworks loosely attached to one or more pieces of board, and the process will involve rearranging the images to explore connections. Perhaps the ideal virtual gallery would involve a two-part process: the first resembling My Met Gallery (but where one could rearrange images in a large, two-dimensional space), and the second resembling the current myVirtualGallery. The experiences of visiting physical and on-line museums have different strengths and limitations and are complementary. Access (in a museum context) is normally measured by the ease with which any visitor can experience the museum's collection. Virtual gallery tools can extend that to a more active, personal engagement by allowing visitors to create new content out of an existing resource and add to that resource. This has the potential to create a new and vital form of cultural networking. However, planners and developers of such tools should be prepared for, and be sensitive to, resistance (ranging from nervousness to hostility) from in-house curatorial staff. myVirtualGallery was developed by Squiz.net (http://www.squiz.net), using a combination of Macromedia Flash technology and the MySource Classic open-source content management system. Conceptual design: the author, in collaboration with John-Paul Syriatowicz. Programming: Mark Brydon and Marc McIntyre. Visual design: Casey Frendin. Cooper, J.M. (2001). AGNSW 12 month plan for the Web. Internal memo to senior staff, Art Gallery of New South Wales, 11 July 2001. Fox, A. (2005). RE: Virtual Gallery. E-mail to the author, 11 March 2005. MacDonald, H. (2005). The Met's Triumphant Democratic Elitism. In City Journal, Winter 2001. http://www.city-journal.org/html/11_1_urbanities-the_mets.html (accessed 19 Sep 2005). Muchinsky, R.M. (2000). Psychology Applied to Work. Belmont, CA, USA: Wadsworth, 341-46. Valenza, J.K. (1998). Real art museums without walls. In Technology Connection, Vol. 4, Issue 9, Feb 1998, 10. http://www.kent.k12.wa.us/KSD/KR/LIBRARY/MUSEUMS/museum_school.html, (accessed 9 Sep 2005).